Each month, your Neighboring Food Co-ops feature our region’s artisan cheesemakers by offering a specially selected cheese at a great price. Look for the “Cave to Co-op” sign in the cheese section at your local food co-op. To find one near you, visit www.nfca.coop/members. Twig Farm is owned by Michael Lee and Emily Sunderman and has been in business since 2005. The twenty-acre farm is located in West Cornwall, Vermont, about 10 miles south of Middlebury. Michael manages the herd of around 50 goats and makes and ages the cheese. Emily manages the business and marketing for Twig Farm and works as an analyst for a publishing company and teaches Suzuki Violin. Michael makes all Twig Farm cheese by hand using traditional techniques and equipment for small-scale artisan cheese production. The cheeses age in a cellar with a temperature and humidity controlled environment. Prior to making Twig Farm cheese, Michael worked as an apprentice at Peaked Mountain Farm in Townsend, Vermont, and before that was a cheese manager at South End Formaggio in Boston, Massachusetts. 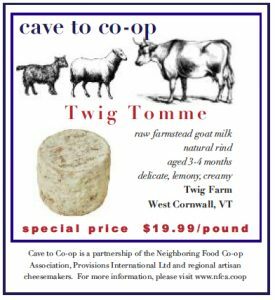 Tomme is the purest expression of Twig Farm’s goat’s milk as it changes from March to December. Don’t be fooled by its rustic exterior! Aged a minimum of 90 days, this semi-firm raw-milk cheese is delicately flavored with notes of roasted almond and lemon peel. Incredibly versatile for pairing: Loire Valley Chenin, off-dry cider, a mid-weight stout or a light red wine would make excellent partners for a little wedge of this goodness! Perfect on its own, here are a few appetizer recipes that will work for the holidays. Heat a broiler. Brush the bread on both sides with the olive oil. Broil until golden and crisp, about 2 minutes per side. Rub the garlic clove over each slice of bread. Top with slices of celery and Twig Tomme. Sprinkle with crushed peppercorns and serve. Place onion in a bowl and season generously with salt. Let sit for 10 minutes. Spread bread generously with butter. Lay cheese on top, drain onion and lay on top of cheese. Garnish with olive oil, pepper and thyme. Cut each slice of bread into 4 triangles. Serve. Arrange everything decoratively on a large board and serve.